ST. CLAIRSVILLE, Ohio — The Bits and Bridles 4-H club met recently. A possible bus trip this summer to the Kentucky Horse Park and Kings Island was discussed, and also a trip in April to Nutrina to the feed plant. A horse clinic will be March 5 in Columbus, and possibly a club clinic in the spring. 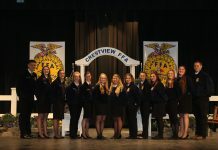 Officers elected were president, Kelsey Onifer; vice president, Ty Hawley; secretary, Diamond Palmer; back up secretary, Stephenie Watkins; treasurer, Samantha Taylor. The next meeting is Jan. 11.